Pattern of coexistent multiple-anastomosing channels (repeated bifurcating and rejoining) with low width-depth ratio. These open channels remain connected to the trunk stream(s). 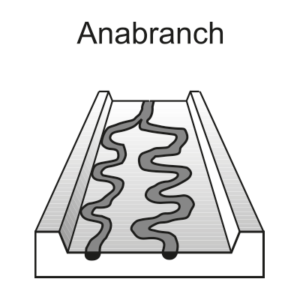 Formed in high flow conditions where the channel avulses to, or reoccupies, another position on the valley floor, but maintains the old channel within a multi-channelled network. These channels are dominated by low-energy, suspended-load deposits.